"The C.U.B. (Compact Utility Blade) was designed to be a compact, lightweight sidekick to a machete/bolo/parang in the jungle or a tomahawk/axe in North America, capable of performing all the important utility duties of camp craft and food preparation, while leaving the heavy work for the chopping tools. With an emphasis on compact, keeping the total blade length under 4" makes it legal to enter most countries internationally without attracting too much attention. The C.U.B. was designed with two of Reuben Bolieu's favorite styles of knives in mind, a Finish Puukko (with a Scandinavian grind) and Kephart style knife. Put them in a blender and you have the TOPS C.U.B. - rugged simplicity!" Natural tan Micarta scales with divot for bow drill. A TOPS modified Scandinavian grind. Thumb notch cut into the scales for a secure, comfortable chest lever grip. A combination fire steel including magnesium rods as well as ferrocium. A miniature fishing kit, razor blade and can opener. The C.U.B comes with plenty of accessories as well as the knife it'self, but the survival kit, pictured above, seems a bit of an afterthought. The firesteel, fresnel lens and whistle are by far the highest quality parts of the survival kit but every TOPS knife comes with a whistle and the knife is really the main event. It's sheath which supposedly could contain the survival kit as well is big disappointment. It is made of fairly poor quality, lightweight nylon and the knife is only retained in the sheath thanks to the bulky top flap which secures relatively loosely over the front with a buckle. This flap can be removed and the knife secured with a Velcro tab around the handle but this doesn't seem secure at all to me. The fit of the sheath to the knife provides no retention at all and you are entirely reliant on the Velcro and buckle to hold the knife in place. This also means that the knife is impossible to use as a bow drill divot while it is still in the sheath which means that you have to hold a naked blade while you bear down on it with a great deal of force and move a bow drill vigorously back and forth inches from that exposed blade as you light your fire, not really as safe as I'd like. The sheath really was a disappointment and really devalues a knife that retails for almost £150, there is no excuse for a sheath that bad at such a high price, the moulded plastic sheaths of budget knives like the Mora Companion are better. The handle of the C.U.B with it's built in bow drill divot is no worse a bearing block than anything else, but it's no better either, it's not magically frictionless and there is an inherent danger in having a naked blade waving around as you work up a coal with your bow drill especially as you will be bearing down on it with considerable force. Also if you have found enough material to make your bow, drill and hearth presumably you have access to another piece of wood which would make a perfectly adequate bearing block as well? While the divot wasn't really as functional as it was hyped to be the handle it'self was fine, the tan micarta provided plenty of grip and while it does look a little angular was actually very comfortable for all tasks. The blade came with what was marketed as a Scandinavian grind with a secondary bevel 'for strength and durability', and it was absolutely razor sharp. Although I personally can't understand the need for the additional edge bevel to 'strengthen' a scandi grind if it used for appropriate tasks, it does still perform superbly in wood carving and whittling. The knife is tastefully marked with the TOPS logo and is finished in a nice stone wash, no coatings to ruin the performance of the edge. It is carbon steel though so the blade will of course need care and attention if you are going to avoid rust. But any knife would. The one complaint I have about the bale is the excessively large finger guard which is uncomfortable and unnecessary in a blade of this size and style. I'm constantly surprised by peoples concern over having a sizable finger guard on their knives, for general woods use and bushcraft finger guards only get in the way of fluid and efficient wood carving as you need to use a variety of grips on the knife. Perhaps it's the youtube trend for doing ridiculous things with knives that inspires manufacturers to include overbuilt finger guards on their knives but I have never needed to stab through a car bonnet or do a so called 'hammer stab' that the keyboard bushcrafters of youtube all think are necessary and reasonable. Finger guards do one of two things, protect you finger from slipping onto the blade or prevent something else sliding up your blade onto your fingers or hand. Neither of which is going to happen while you are bushcrafting. I eventually ground the finger guard off completely so it became more comfortable to use and so it fit better in the kydex sheath I made to replace the very poor nylon original. 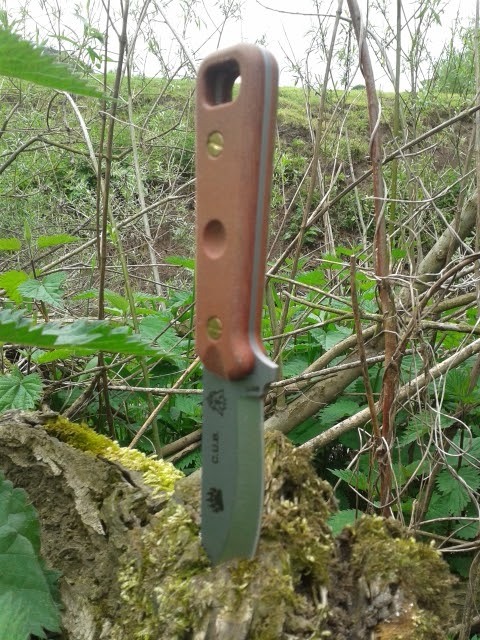 In terms of size and blade style the TOPS C.U.B is a great bushcraft knife, the modifications I made to mine ironed out the few problems I had with it and I was very impressed overall with the performance of the knife for general bushcraft tasks and for small game preparation. 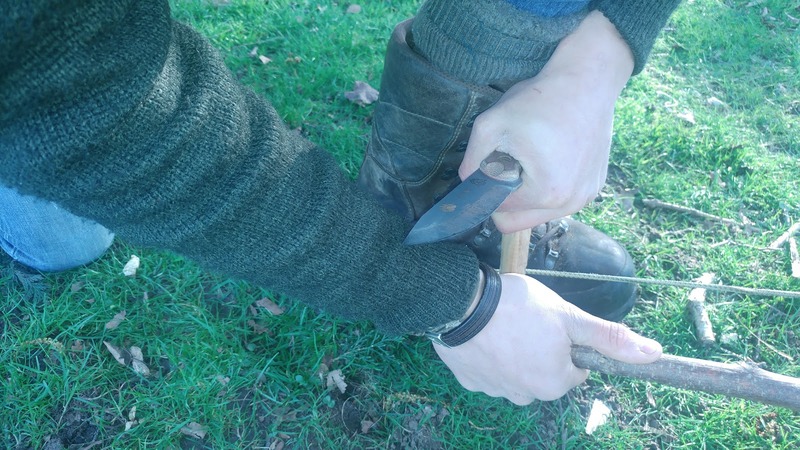 Many bushcraft and survival knives have longer blades but the C.U.B blade is an ideal length for all sensible bushcraft tasks. A longer blade is really not necessary for most tasks and the continuous curve makes carving a breeze. The slight clip point brings the point down from the spine of the blade and makes drilling and tip carving easy, the short blade makes it easy to support the tip of the knife with a finger or thumb on the back of the blade. I would normally include a lesson in a review blog but the C.U.B has already featured in a lesson on how to make a simple willow or sycamore whistle which you can find HERE. The knife was sourced from Hennie Haynes based in Cardiff South Wales and who are the best in business when it comes to fixed and folding knives.